Frogg Café is one of those bands with influences you can probably spot, but whom you’d be hard pressed to describe. 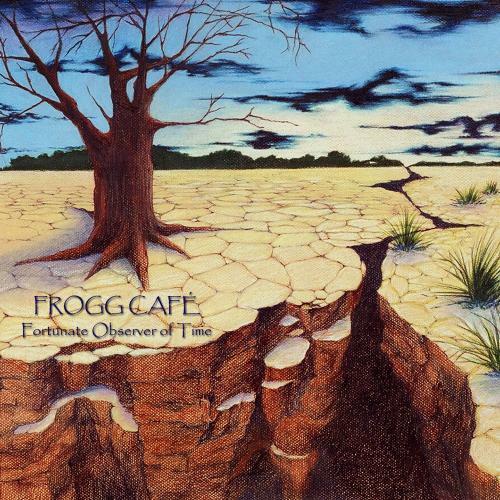 Their new one takes its cues from lots of places: classic progressive rock, orchestral jazz, fusion, and even 20th Century classical music all appear within the eclectic stew that is the Frogg Café sound. Underlying it all is a certain vibrant American adventurous spirit and willingness to break rules while still showing respect for forms and traditions. The band members, from the New York area, have all received higher education in music with several now educators themselves. This can often lead to a very clinical approach to music, but guiding this outfit is a willingness to embrace creativity and originality and to even have fun. Songs like “You’re Still Sleeping” recall Gentle Giant’s polyrhythmic agility and flair for non-standard instrumentation plus a blindness to stylistic barriers that allows them to go from odd-meter prog riffing to swinging jazz (featuring a slick trombone solo from John Lieto) without missing a beat. Drummer James Guarnieri’s mallets lend a Zappa-esque touch to songs like “Reluctant Observer” that gets a fuller exploration in the theatrical “Abyss of Dissension” which encompasses stately brass arrangements, sassy jazz, and mock-demonic verse that would certainly put a smile on Frank’s face. In case the genre bending abilities hadn’t yet been proven, the album closes with a harmonically challenging chamber composition featuring flute and strings. Eclecticism is definitely on the menu here – get it while it’s hot.